It’s getting to the point that Sunstar’s origins as a maker of budget-minded models has started to fade into the past. Far be it for me to keep those hoary old days alive – especially in light of the maker’s far more successful string of exceptional, “Platinum Collection” cars. 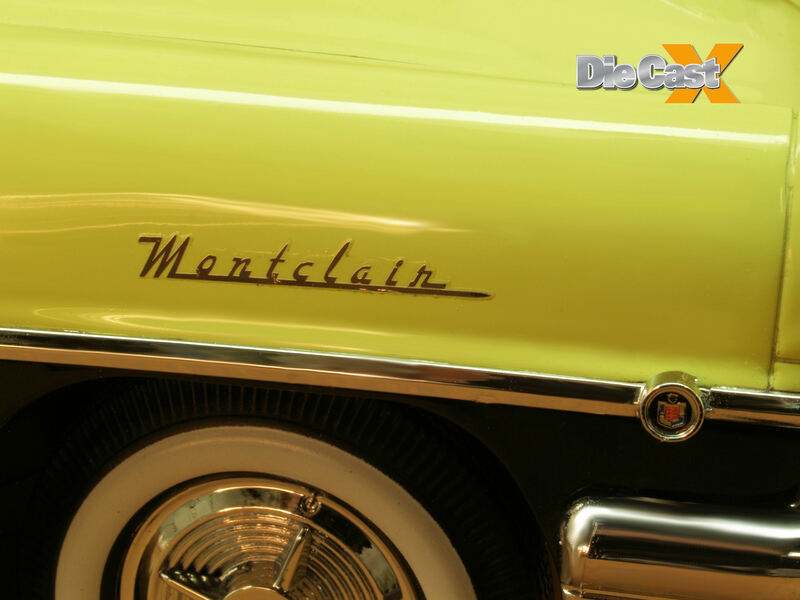 Here’s the 1956 Mercury Montclair they’ve been making for a little while now, for your perusal. I love this hardtop version, in every color they’ve made, and I’m pretty sure I’m not alone. This pair wears true ‘fifties color schemes (Persimmon and Classic White, and Tuxedo Black and Grove Green) on smooth, well-prepped castings, with all the usual Platinum eye candy: photoetched “Montclair” badging, outstanding, deeply flashed chrome, and Mint-quality lensing and glass. You can’t help but love these things; the effort put forth is apparent right from the start. The gizmo list is always impressive on these upscale Sunstars, too, and the Mercs don’t disappoint. 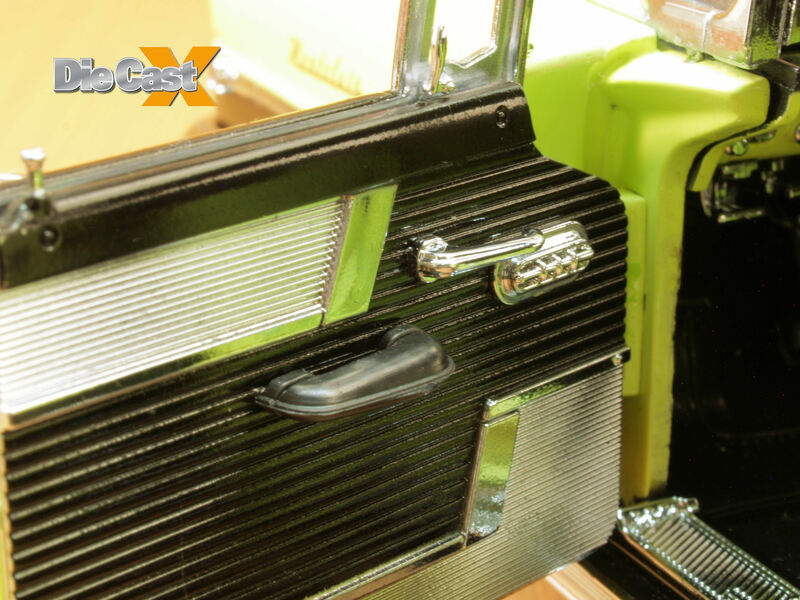 Opening doors, hood, and trunk, steerable wheels, a working suspension, and a cabin with poseable working visors, tilting seat backs, and an opening glove box all worked well – a definite improvement in QC that makes the features fun, not fear-inducing to operate. 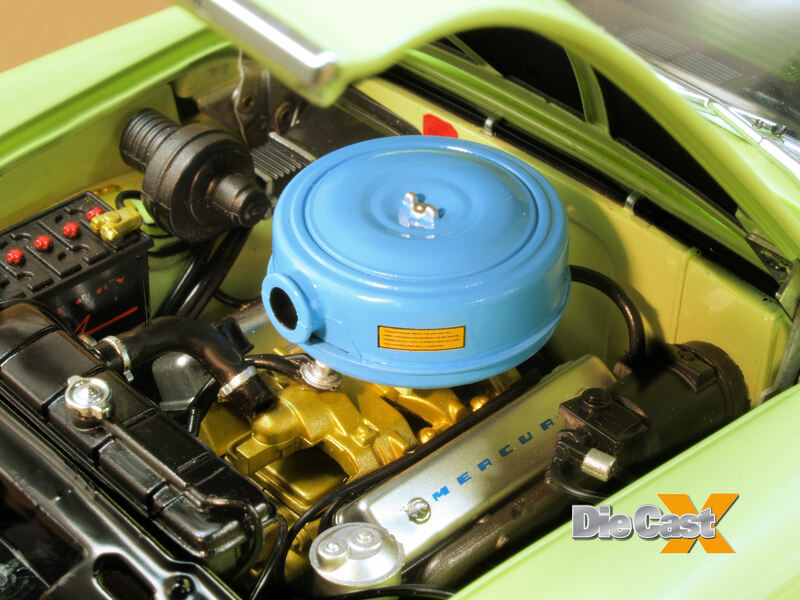 Under the hood, the 312 V8 is gob-smacking good, and it’s been wrapped in an engine bay that has every wire and cable – no, really – running across the inner fenders, the firewall, and on the motor itself. They’ve even hung a couple of labels in here. 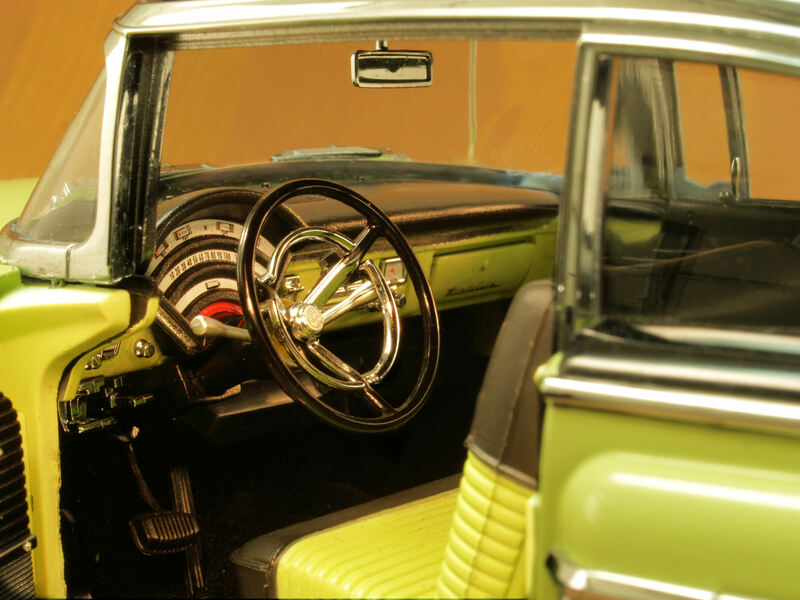 Inside, the cars are pure mid-century American lux, served up with pleated, two-toned seats, a carpeted floor, and a knob-and-switch encrusted dash that’s labeled, and looks operable. 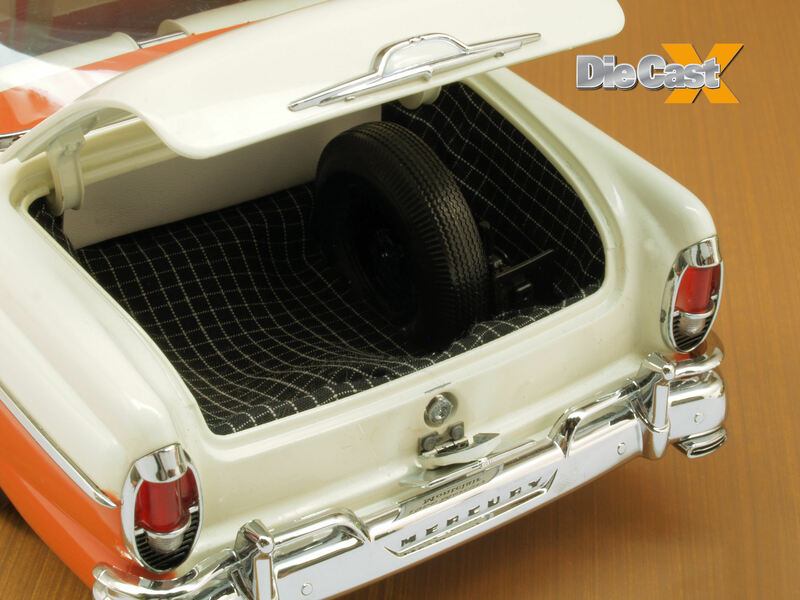 The trunk on these is always a hoot; Sunstar puts textile mats into the models, and more often than not, they’re 1:1 patterns taken from the real cars. This one’s a little blousy – not really snugged down – but the jack and spare are here, on the other side of a tilt-down license plate gas filler cover. Go beneath the model, and a nicely textured, fully detailed plastic chassis is complete to its brake cables and exhaust clamps. This is a truly entertaining series of cars. Sunstar has found a niche, and they’re maxing it out by populating it with ever-better models at affordable, everyman prices… sort of what the late, lamented Mercury brand did, back when this car prowled the highways. 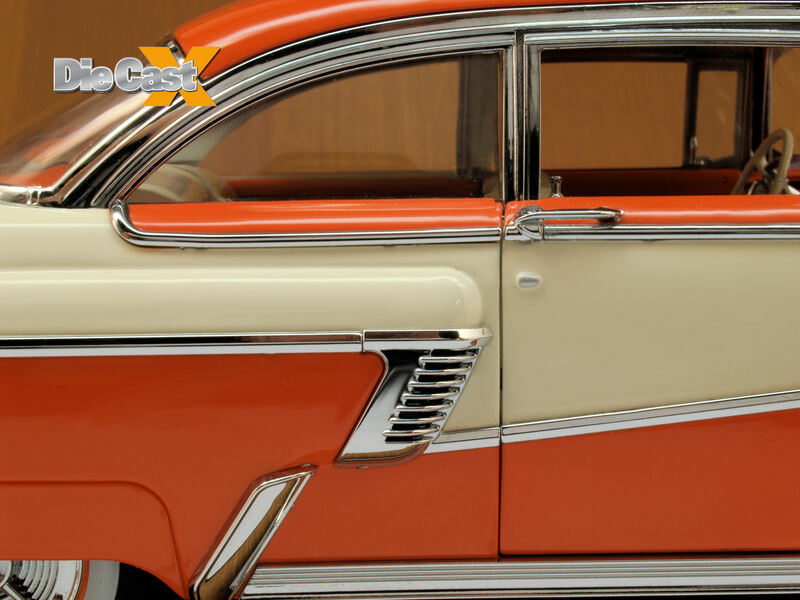 Like the ‘fifties? Me, too. Highest recommendation. 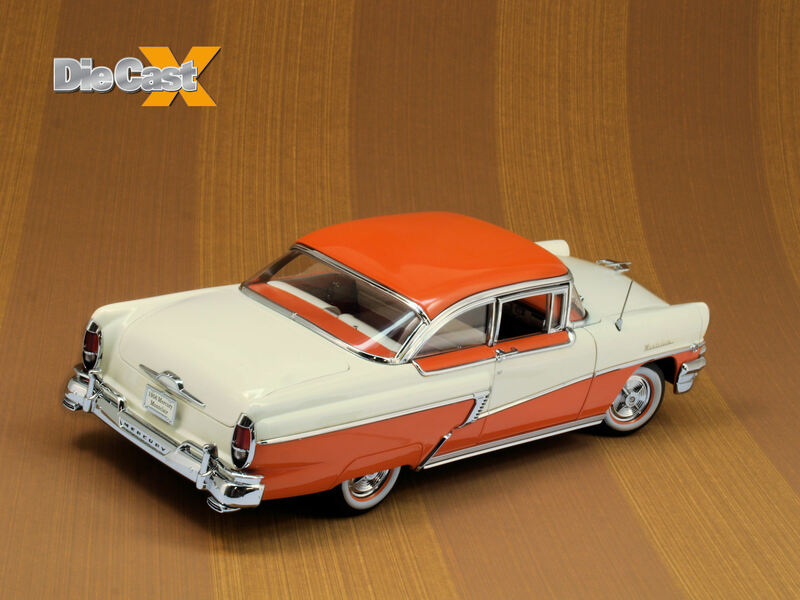 I owned one of these 56 Mercury Montclairs in the ‘orange’ and white tutone color. It was an awesome car, and so is this model of it. Thanks for writing. My neighbor has one in light blue and white. It’s incredible. Sunstar’s been improving their game steadily over the past few years, and I love what they’ve been doing as far as subject matter. 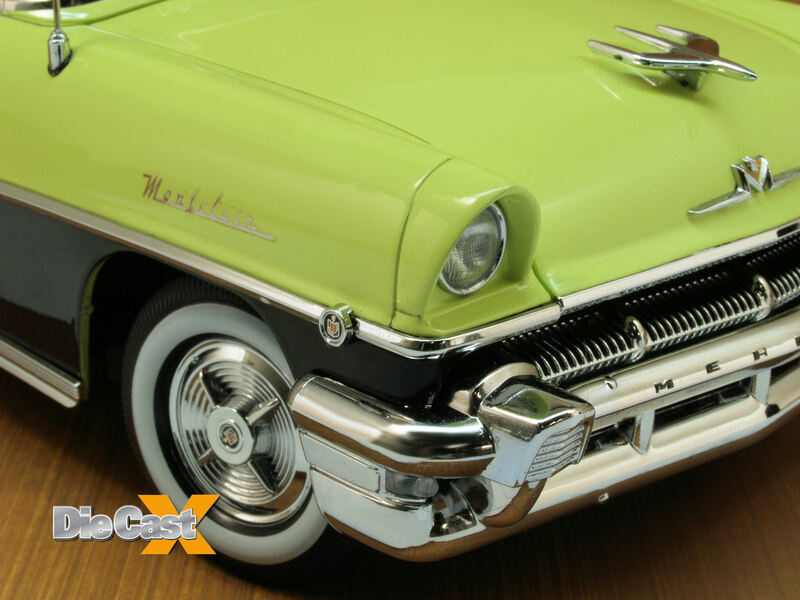 Wait ’til you see the ’60 Plymouth Fury they have on deck – wow! 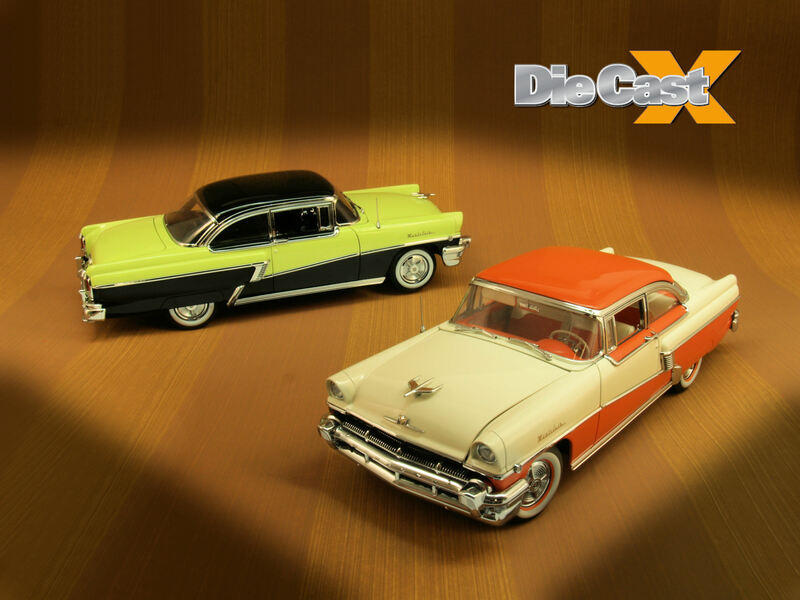 Thanks again for writing – and for reading Die Cast X.